Hakata Dontaku is the festival held in the third and fourth of May in Fukuoka, Japan. The total number of persons who attend and visit this fesival is two million, and is one of biggest in Japan. 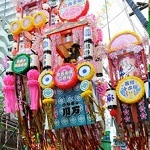 Old and young, men and women parade in disguise with beating rice scoops(Shamoji) in this festival. Finally, people gather in a public square and dance Dontaku Odori. Hakata Dontaku started in 1179A.D, and its origin is Matsubayashi which is a ceremony at the begining of the year. After Matsubayashi changed name several times and halted temporarily, Hakata Dontaku was named with current style in 1962. Dontaku derives from zondag means holiday in Dutch. Matsubayashi is included in Hakata Dontaku now. People costumed as three deities of good luck ride a horse to several temples and shrines and others, and children sing a celebratory song like people used to do. 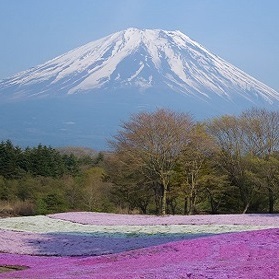 It is designated as Japanse Intangible Cultural Property in 1976. Dontaku Parade and So-odori is main key point of this festival except Matsbayashi. In Dontaku Parade, festival cars like hero series and animation for children run with a fancy-dress procession and people dancing samba. Disney characters, Mickey and Minnie, appeared in this parade several years ago. In So-odori, local people and visitors dance Dontaku Odori with rice scoop(Shamoji) at public square together. You can join it, but you should have rice scoop as possible. Dancing with rice scoop is originate in housewife stopped cooking and started dancing with it. She could not help dancing when she heard Dontaku music. By the way, Hakata city in Fukuoka has many local foods, Karashi Mentaiko and Hakata Ramen and more. Karashi Mentaiko made of salted cod roe with red pepper go well not only with rice but also Hakata Ramen. Japanese Hakata Ramen shop "Ippudo" which opens in NewYork serves Ramen and Mentaiko over rice. Japanese hot pot dishes, Motsunabe and Mizutaki, are so good in winter. 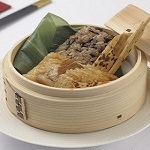 Motsunabe is made from beef or pork tripe or offal with soy sause soup. It has distinct texture and flavor. Mizutaki is made from chicken meat and vegerabeles with dashi soup. It has lightly taste and favor of Dashi. It takes two hours from Tokyo to Hakata by airplane, and takes one hour from Oosaka or Kyoto. If you travel Japan in the third and fourth of May, you can enjoy Hakata Dontaku. You can experience Japanese culture through it.